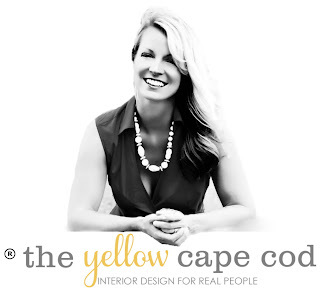 The Yellow Cape Cod: What inspired your latest home project~and a $100 giveaway! 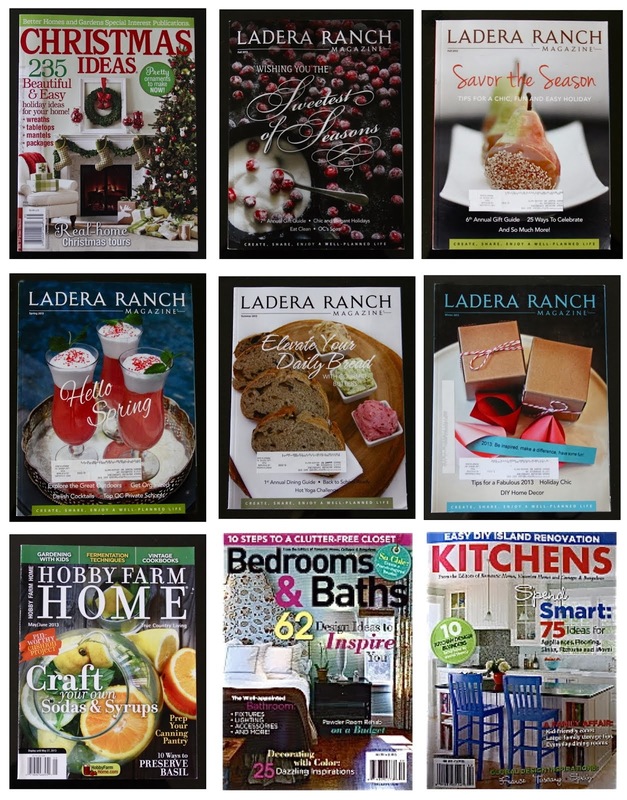 What inspired your latest home project~and a $100 giveaway! Recently, I was given the opportunity participate in Crystal Light's Liquid Living Vibrantly Campaign. I was asked to explore Crystal Light Liquid's flavor options and sample Crystal Light Liquid while searching for inspiration for a project that would bring flavor and vibrancy to my life. My thoughts immediately went to sipping Crystal Light Liquid poolside with the kids this summer. Of course, the piece would need a unique frame from one of my local thrift shops. Cameron's art, a summertime decor vignette and a thrifting adventure, my "living vibrantly" project fell right into place. He determined it was only fair that he got paybacks if I was going to photograph him popping tags. So, here I am giving him the official we-found-the-perfect-frame thumbs up. Cam's original painting was a bit large, so we stopped at the office supply store and asked them to reduce the size to fit inside our frame. I removed the painting from our thrift store frame, spray painted it glossy black and inserted Cam's art, covered by a piece of pre-cut plexi glass. Using the art as my color road map, I created a vibrant summertime vignette in our living room bookcase. 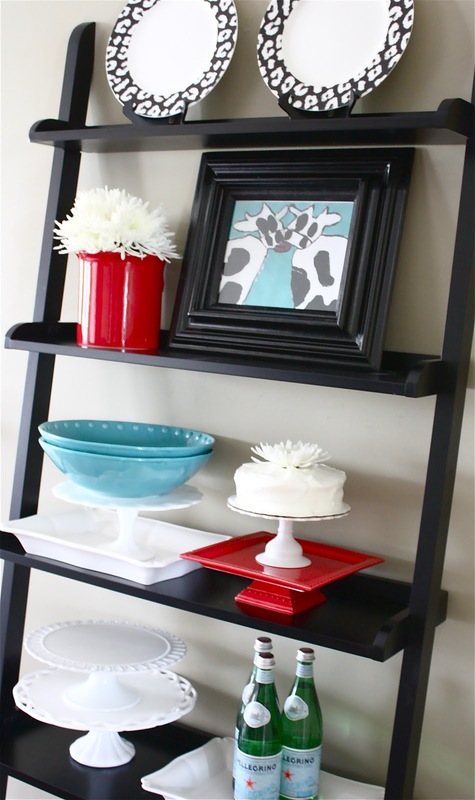 I scored bright turquoise and red serving pieces in the clearance section of a discount home store. We are enjoying the new pop of color in the living room. It has us excited for summertime entertaining. What I love most is that Cameron's art is the center of this project. 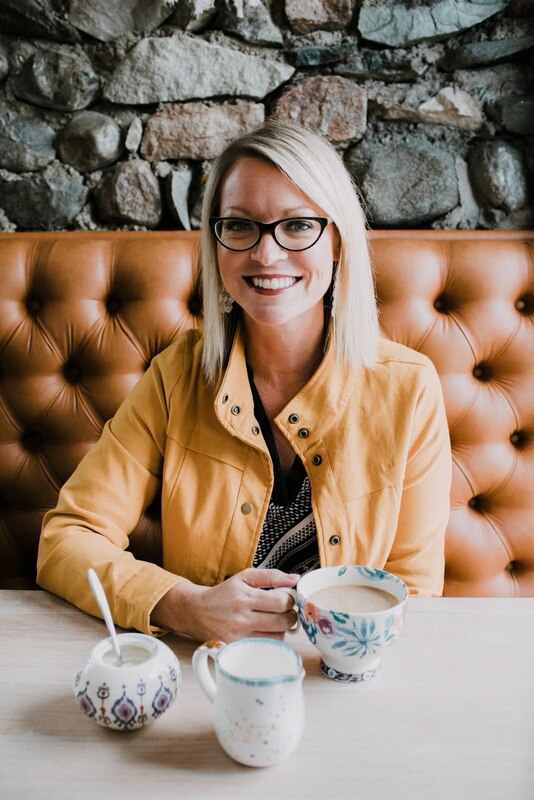 Thank you, Crystal Light Liquid and Blogher for giving me the opportunity to sample the new Crystal Light Liquid and create a project that involved my three passions: my family, home design and a deal hunt. My interpretation of "living vibrantly. What inspired your most recent home decor project? One of our spare bedrooms had a leaking window. Turned out this was a blessing in disguise as it gave us an opportunity to gut that room, put insulation (which had never been done) and turn it into the coastal room that I had been dreaming of. There's a bigger closet now, and great shelves with a desk that is perfect for our grandchildren. We just installed board and batten in our office, and I am now looking forward to decorating it. I just purchased an old secretary and am picking out a fun paint color for it. Thanks for the chance to win! What inspired my recent home improvement project? A whirlpool commercial entitled "Teen Jeans". Love, love, love the crystal door knobs in the commercial, so I bought one off of eBay and installed in on a bedroom closet door. I chose my kitchen colors because of the colors of a dish towel I purchased. The best part of this project, however is that I'm able to gift my old furniture to someone in need. This person doesn't have any furniture. As soon as my new sofa and loveseat arrive she will be getting a sofa, chair & 1/2 and matching ottoman! We just painted our house-except for the dining room, so it's time for that room. I've been putting it off because I'd like to change it into more of a family room/reading area and I'm not sure how to do it. I moved some furniture around yesterday so that's the start! I have been inspired by ideas on Houzz -- love it! I just take the idea, scale it down to my (very basic) level, and go for it! LOVE this look and the colors you chose are AMAZING!!! I just finished painting the wall behind our living room bookcases black. In the middle bookcase, I hung a colorful water color painting my daughter made in Kindergarten in a frame I spray painted gold. I love to use my kids artwork in our home whenever I can. Love your son's painting! The change of seasons always inspires me to redecorate a room or two. I'm working on my sunroom now! The change of seasons always inspires me to redecorate a room. I'm working on my sunroom now! I LOVE the colored dishes stacked with white! Refreshing! LOVE the mix of white and cheery colored dishes!!! Refreshing! I bought two PB duvet covers over a year ago for my girls. Finally am doing something with them, and the room around them! My attempt at a "minor" spruce up of the guest bathroom turned into installing a new vanity and granite countertops, so my summer updates are done!!! My husband just renovated our old and dreary "mudroom" into an insulated, white wainscoted, painted Tuscan peony red mudroom that is a bright and happy entrance. Honestly, my inspiration was Pinterest :). My husband and I just renovated our dreary and drafty "mudroom" into an insulated, white wainscoted, painted Tuscan peony red bright and cheery entrance, Honestly, my inspiration was Pinterest :). Love the picture frame you scored at Goodwill! I recently found an old dresser at Goodwill that I painted black and re-purposed into a buffet. 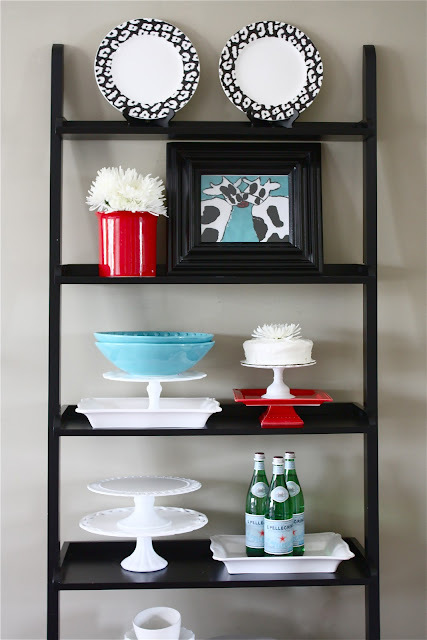 Next I want to put up a floating shelf above it to display dinnerware! Seeing all of the chalkboard posts of various bloggers made me try my hand at chalkboard painting the glass of two large picture frames. 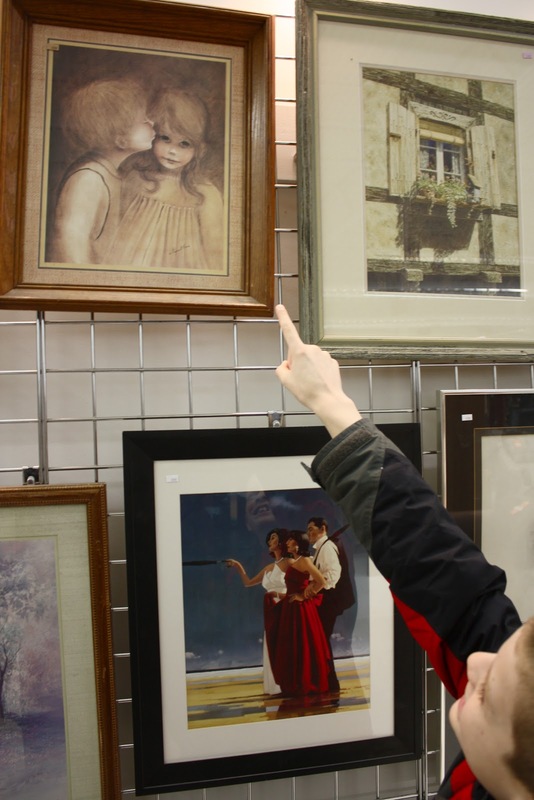 I had also seen where one family had taken a large collage picture frame and placed pictures of family and friends in it that they pray for. So after the chalkboard paint was dry I hung them next to the collage picture frame in the hallway where we enter our home so that we can see our friends and family as well as special notes, reminders, inspirational quotes, or Bible verses. Happiness!!! My inspiration came from the need to finally brighten up my bedroom from the dull cream on the walls, to a very pretty teal. I couldn't stand the dull color anymore. I found an old four poster redwood bed on a FB buy/sell/trade site and was inspired by a picture I saw online of a bed painted with chalk paint. Found the paint (duck egg blue) and I'm now in the process of painting the bed and redecorating my 6 year old daughter's room around the bed. I can't wait to post pictures after I'm done. I saw this awesome pallet wood wall art and wanted to make it my own. I painted my bedroom and bought the wood in Home Depot. I stained the wood then used my Silhouette Cameo to cut out the lettering. I love it! A photo I saw on Pinterest of a bedroom -- it inspired the paint color and new bedding I chose for my room. A print of a place in my hometown... I'm pulling colors from it for a den re-do. I took apart a childrens book to make some wall art for my daughters play room. I am currently working on a few DIY projects for my niece and nephew's birthday. One is an earring holder and the other is yarn art in the shape of a police badge. Both inspired from Pinterest! I took a girls' trip to Venice about 1 1/2 years ago and snapped a photo of some laundry hanging over a street; I plan on enlarging the picture to hang in my laundry room as I spruce it up. My recent project was inspired by the bright colors of spring. I got a bright colored table cloth for my dining room and hung a butterfly picture on the wall and I also buy fresh flowers to set out. We were inspired to paint a chocolate brown accent wall after seeing one on a home design TV show. I was inspired when the weather turned and it was spring! 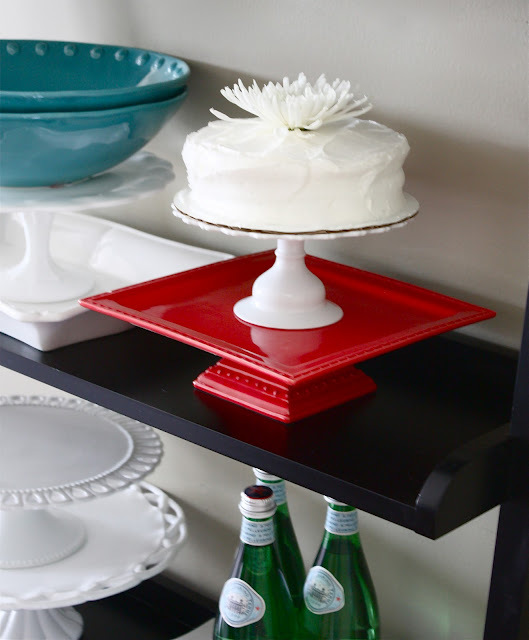 My latest vignette was created around a beautiful, large, glass cake stand which I won in a silent auction! I love it! I've been inspired because of many of my friends are trying to sell their homes. Even though we aren't in the market to move, it has inspired me to be more proactive and get some projects done so we can enjoy them as well as be prepared should the opportunity arise. Pinterest has inspired my gallery wall in the hallway. I love it. Very similar to your story...my son made the most amazing abstract watercolor with lots of pops of color. 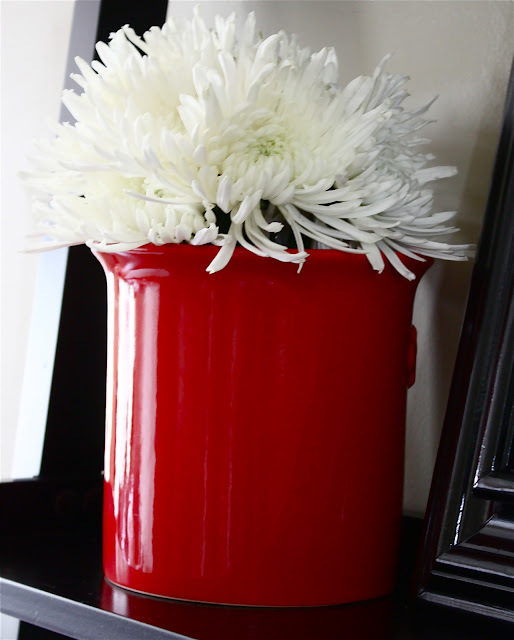 It inspired me to paint our small powder room a dark gray...the perfect backdrop to his colorful piece! I love seeing it everytime I walk in and he loves having it take center stage. The inspiration for my latest design update came from the fact that we live on my husband's family farm where cattle still graze. I am adding a white cowhide rug to my husband's man cave in the basement to set off the charcoal leather furniture and antique chest/coffee table. I was trying to coordinate our living room and kitchen together. We had gray walls in the kitchen with white cabinets and then green couches. I want new couches but can't afford them right now. So when I found throw pillows that were green, gray, yellow and a reddish orange, I knew that was the perfect colors to tie the rooms together. So I found a couple accessories in yellow and red and it was perfect! I had to get a new dishwasher because mine was leaking! That's a good inspitation! I was inspired to to do change some of the decor in the family room because I wanted to add more color to the room.It's always been neutral colors and I was ready for a change. We were removing wallpaper and decided to update other items in the room. Our new mint green paint color in the kitchen! I saw it on a house nearby and loved it. HGTV's Design on a Dime inspired me to redo a bench and add a cushion. I love the turquoise & red combination and your son's art! I wanted to add some color to my sofas in the family room and that was how it started. I ended up doing the whole room and it looks so much different. My most recent home project was putting together a tall chrome shelving unit to hold my pantry goods, instead of having them in bags and boxes. My sister has the same shelves and wanted me to remember to put the lip of the shelf down, since she had to take it apart and make it the right way. The shelves reside in a back hallway alcove and have inspired me to tackle another room for organizing. My next project is framing a bright fabric to use as a picture on my wall. my love of the beach inspired my most recent home decor project! My love of summertime inspired my most recent project. I troll Pinterest for design ideas and found some for my latest home decor project of buying a bench for our bedroom. Our arrival of a new baby in July inspired us to rearrange our house and move rooms around! What inspired our most recent home decor is a modern rug that I picked up at the store and fell in love with. We painted our walls a more modern (beige) color and I added a hint of red with throw pillows and paintings. Other people's beautiful homes on Pinterest. Someday! 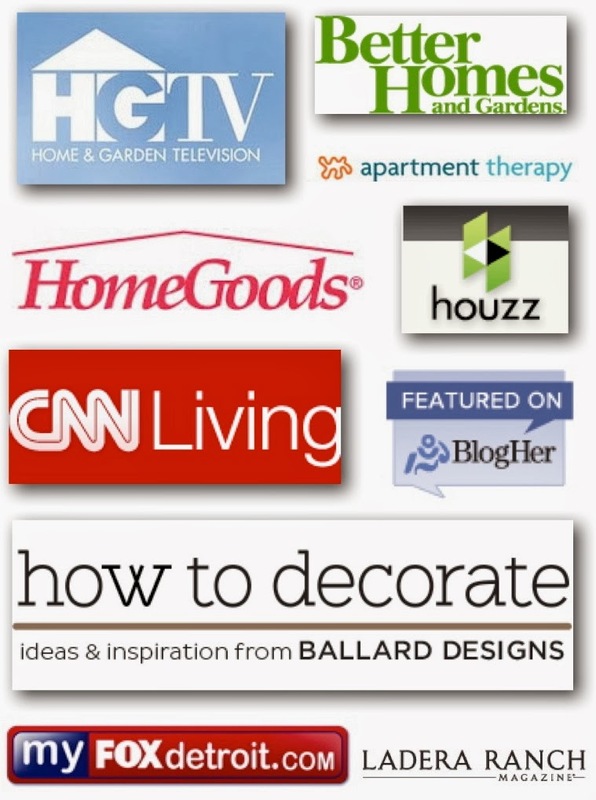 Pinterest and the handful, ok two handfuls of blogs I read daily!! My son's graduation party put me in high gear, and adding some of his previous school pics, framed on the mantel was a fun touch! Pinterest usually is what inspires me. I was inspired by my sons favorite story books to redecorate his room based on their theme, he likes Beatrix Potter stories so we have a lot of pastels in his room. I found a lamp I loved and had to have. It gave me inspiration to redo an area of our great room. The room we want to decorate is a room we use for birdwatching, so we're definitely going to have a "bird" theme to the room. I recently went overboard purging my house of stuff and realized how bare the walls and shelves were. So I had to add some items and some color to jazz the place back up. in-laws visiting and love of flowers! A shopping trip to the furniture store inspired my last decorating project. I got lots of good ideas from the displays there. My new house was the inspiration. My new house too! I moved in September. We redid our bedroom because we wanted it to be better for sleeping. We painted the walls a pastel blue and added light accents. We've lived in a house for 25 years that had a 48" wide bathroom. Toilet and tub on the short wall!!! We just completed a 10 week long reno that moved the bathroom, expanded the kitchen, gave me a real bedroom closet AND turned those 48" into a pantry! I think my most recent inspiration was a couple of pictures I saw on Pinterest. I wanted a dramatic room, so I went with dramatic colors for linens and decor. Didn't quite turn out as I planned, but I will try again! Coastal Living inspired my living room's beach theme. My most recent project was based on a quilt my mother had made many years ago. I found fabric with a similar color palette and made my own version of the quilt. Then I was able to use those colors to completely revamp my bedroom. Every time I look at the quilt I think of my mother. Nature. Nature inspires almost all of my interior decor. My last decorating project happened when I was gifted with several large hanging plant baskets. Im not very "creatively gifted" but I came across some neat, stone-textured spray paint and it got me needing to use it somewhere lol went to work on the corner shelf unit in our bathroom and it actually came out looking awesome! Our most recent room makeover was for my daughters room. We moved it into a princess room for her! We are so very close to moving into a new house - it hasn't gone smoothly or quickly, so I've been trying to stay positive by planning the decor for each room in the home. I bought a mirror at a sale so that inspired me to redo the bathroom. My daughter grew out of her baby looking bedroom, so we had to update it a bit to make it something she can grow old with. I saw an iron tree with tealights... fell in love with it and just had to have it! It looks great above my sofa! My new curtains didn't really match my decor, and I really had to change things. My toddler sons love of Thomas the Train inspired us to repaint his room a brighter blue. Hubby and I enjoy watching the home improvement shows which recently inspired me to give a spruce up our bedroom by buying new sheets, comforter and decorative pillows. My inspiration was drawn from my desire to have a more grown up bedroom. I still had all of the mismatched pieces of furniture from when I was a teenager and was in desperate need of an update. My great grandparents farmhouse inspired our latest kitchen upgrades. home improvement shows inspired me to redo my bathroom. My books and love of reading inspired my reading room. Went shopping and just happened to see something I loved and tried to work my bathroom decor around it. We had so much damage to our kitchen because of Hurricane Katrina we were in the final stages of putting it all together. I decided that it was time for a brand new look instead of the old one. I saw a beautiful red and yellow kitchen on HGTV one day and fell in love with it. I had never done such bold colors before so decided to give it a try. It is the most beautiful kitchen I have ever had! Several years ago I bought three white box shelves and a bunch of black frames from IKEA. I printed out a bunch of colored photos from a trip to Paris. The project just wasn't coming together and the frames went back in a closet. Last month when we got back from another trip to Paris, I got a new inspiration. I reprinted my photos in black and white and suddenly it came together. We hung the shelves, arranged the different sized frames and added a small globe and an old silver cream. The wall was finally complete. Fun finds from garage sales inspire me. The frogs that i collect inspired a whole room. needing a new look inspired my last project! Victoria's and Billy's new livingroom on Young and the Restless! Cleaning out my grandmother's house after she passed away was a huge impetus to add some vintage/retro touches that I LOVE! My pup tearing up my bathroom floor gave me even more of a reason to redo the whole bathroom.